The SVGS Corner is a place to catch a glimpse of the daily life of Shenandoah Valley Governor’s School STEM students. Here you will find articles about the special opportunities SVGS offers in its classes as well as the research projects and capstones our juniors and seniors are hard at work on. Check back regularly to keep up-to-date with SVGS STEM students! Calculus: Cooking up Something Hot! The sound of boiling water fills the room known as the Think Tank at Shenandoah Valley Governor’s School. A mug in the shape of a narwhal sits on the table. The other students in the class have also brought with them other types of thermoses and mugs for holding hot water. Mr. Erik Nylander goes around the room and fills the students’ mugs with hot, steaming water. This is the scene of lab day this week in Dual Enrollment (DE)/Governor’s School Calculus. The students of DE Calculus are in the differential equations unit of the class, hard at work learning about separable differential equations and their real-life applications. The dual enrollment course at SVGS counts for credit at Blue Ridge Community College for a total of eight college credits. Each semester is a class (Math 263 and Math 264) and counts for four credits each. This week’s lab is hands-on. Usually when people imagine a math classroom, they do not picture data collection and steaming cups of hot water. That, however, is part of today’s agenda. 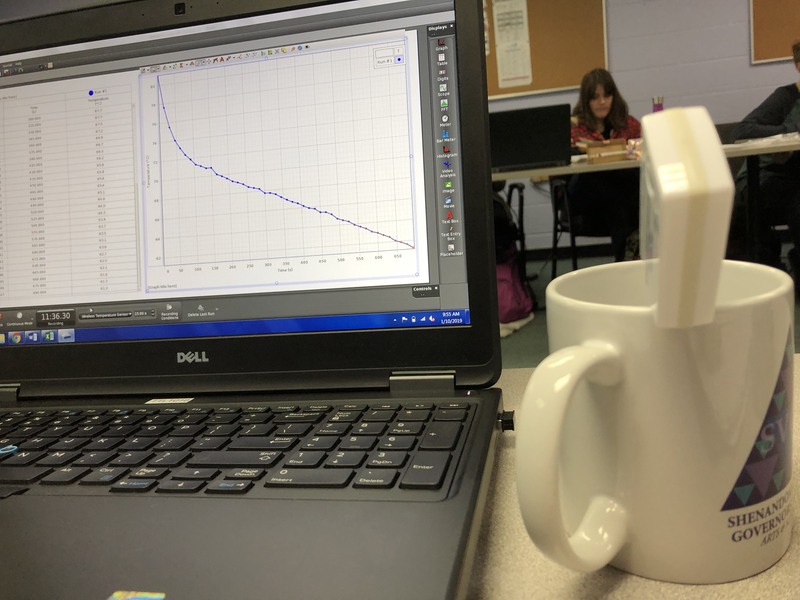 The purpose of this lab is to collect data and use it to create differential equations modeling the rate at which hot water cools in the thermoses and mugs the students have chosen to bring. It’s interesting to see which brand of thermos or mug keeps water hot the longest. Plus, after data collection, students are allowed to make hot chocolate or tea with the leftover water! Calculus labs at SVGS offer students a hands-on experience that enables them to learn calculus in a fun way while also teaching them how to approach a problem and apply the necessary math to solve it. Labs like this one equip students to solve their own math problems in the real world. Hot chocolate is just an added bonus.